Continuing with this story from VZGLIAD, the reporter is Dmitry Bavyrin. Where we left off, we saw that the job of National Archivist for the Ukrainian historical archives, was to go to an ardent Nationalist, who would make sure that only the “correct” version of the Ukrainian past was to be preserved. Job Description: Must be Stepan Bandera fan; must be proficient with a shredder. 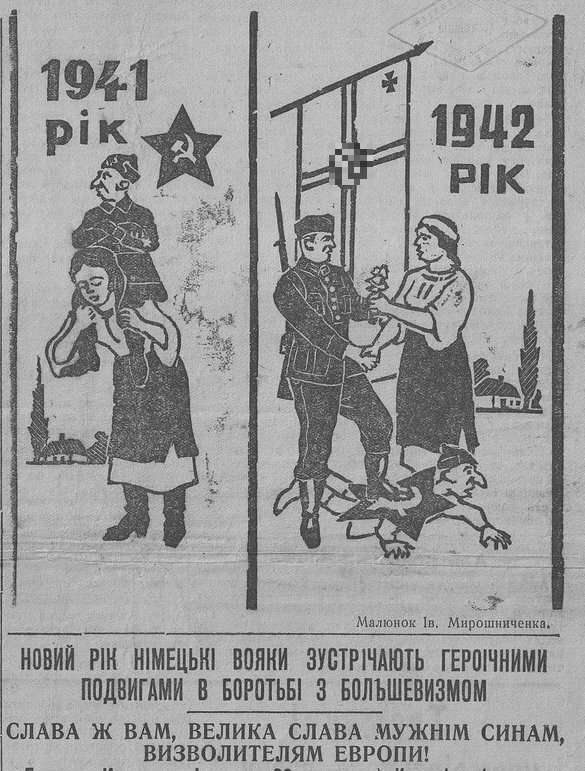 From a newspaper in Nazi-occupied Ukraine: In 1941 the Jewish Commissar rides the peasant; in 1942, thanks to the Nazis, the situation is reversed. The man for the job was Volodymyr Viatrovych. As a student of History, Viatrovych had a single consuming interest: The Ukrainian Nationalists of the 20th century. His “academic” writings set out to turn his personal heroes into national heroes, and to defend them from accusations of criminality; as if he were their hired lawyer. The theme of his candidate dissertation: Viatrovych set out to prove that the various cross-border “raids” which Ukrainian Nationalists carried out — these were just their benevolent attempts to organize “democratic revolutions” in neighboring countries; to liberate the enslaved nations of Eastern Europe. Hence, the Ukrainian Nationalists were not simply heroes of the Ukrainian people, but also benefactors for their neighbors! Publish or Perish, indeed. In short, Viatrovych is not a real historian, he is just a crude propagandist. Unfortunately, Viatrovych was able to successfully mimick a historian, in that most of his work life he spent sculling around in archives. The man knows his way around the Dewey Decimal System (or the Russian equivalent), and this became his gainful employment. From 2008-2010 he worked as the main archivist for the Ukrainian SBU (secret police, successor to the Soviet KGB). After the Maidan coup, the Supreme Rada triumphantly unsealed the heretofore “secret” archives of the KGB of the Ukrainian SSR. In order to “reveal the truth” to the people. In reality, this was just a cover for inserting Viatrovych into the Holies of Holies. Endowing him with full powers of Falsification, as he worked his way through the stacks, numbering and renumbering artifacts. 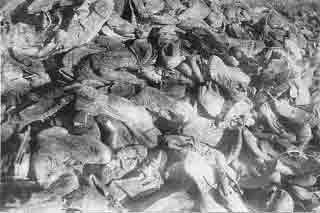 It is estimated that Stetsko killed 7,000 Ukrainian Jews, all of them just ordinary people. Documents proving the crimes committed by one of another of the Nationalists were replaced by counterfeits. Viatrovych himself did not compose the counterfeits (that we know of). Most of the counterfeits were composed by the historical figures themselves; and the international community has been aware of these fake documents and knew that they were fake. Here is one example: Take Yaroslav Stetsko. Please take him. During the war, Stetsko participated in ethnic cleansing activities and crimes against humanity. After his side lost the war, escaping to asylum in the West, Stetsko self-published fake documents “proving” how he had tried to put a stop to the persecution of Jews. Uh huh. Genuine documents, tagged and numbered, suddenly started “losing” whole paragraphs and pages. Specifically those pages which did not speak well of Nationalist activities. Oh well, blame the moths and rats, they like to eat paper and appear to be very selective in their dietary habits. A third possibility is mentioned: We don’t know for sure, and can’t prove it, but there is a very great probability (risk) that Viatrovych has simply destroyed some documents. Like, just cavalierly tossed them in the fire. We wouldn’t put it past him, according to Bavyrin. Next: The Russian warrant against Viatrovych, is he shaking in his boots?